Whether you create an organization chart manually or automatically using the wizard, you might want to modify the appearance and attributes of the org chart shapes after they’re on the page. Previous versions of Visio allowed you to resize org chart rectangles, adjust spacing, and use more than a dozen alternate layouts. You can still do all of those things with Visio 2013, but you also have the ability to create radically different looking organization charts if you choose. Visio 2013 includes 10 highly varied org chart styles and more than one hundred new theme-compatible shapes. In addition, the Org Chart tab on the Visio ribbon has been redesigned so that many features that were difficult to find in previous versions are now much more accessible. 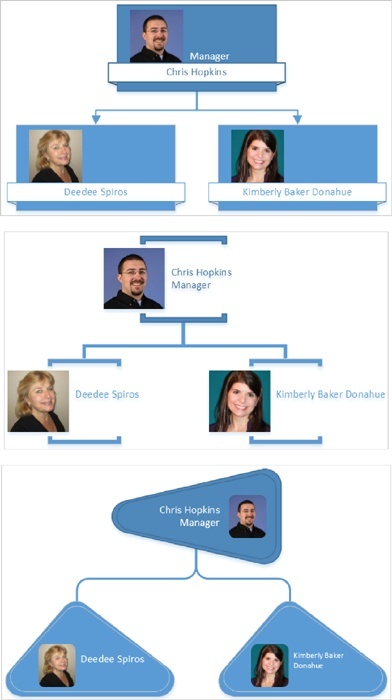 You can change the layout of an org chart by using more than a dozen predefined layouts, each of which varies the spacing and connections between shapes. On the Org Chart tab, in the Layout group, click Layout to select from a variety of options. When the Apply Automatic Layouts to Shape Styles option at the bottom of the layout options list is selected, Visio will re-layout your org chart every time you apply a style. You can retain your current layout when you change styles by clearing the option first. 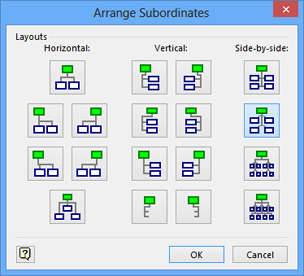 As an alternative, right-click any shape with subordinates, and then click Arrange Subordinates. Visio opens a dialog box showing all of the built-in layouts. If you don’t like the results of any re-layout operation—no matter how radical the changes—you can restore the previous layout with a single undo. Simply type Ctrl+Z or click the Undo button on the Quick Access Toolbar. If you’ve made manual adjustments to shape position or size, the Re-Layout button, also in the Layout group, will move required shapes to ensure correct positions. The Best Fit To Page button relocates the entire org chart to better fit on the current page. You rearrange an organization chart by increasing or decreasing the vertical spacing between shapes or groups of shapes using the Spacing buttons in the Arrange group. Also in the Arrange group, the left and right Move arrows change the horizontal spacing. If you want to hide some sections of your org chart, select an Executive or Manager shape, and then click Show/Hide Subordinates (you can accomplish the same thing by right-clicking a shape and then clicking Show Subordinates or Hide Subordinates). A Manager shape with hidden subordinates displays an icon in the lower–right corner of the shape to indicate their presence. The Shapes group contains the Org Chart style gallery that you can use to change the appearance of your chart. From top to bottom, the following graphic shows three of the 10 org chart styles: Belt, Bound, and Stone. The Shapes group contains buttons that let you adjust the height and width of some or all of the shapes in the org chart; you can select specific shapes to adjust them or click the buttons with no shapes selected to affect all shapes on the page. The final button in the Shapes group lets you convert a shape to a different type of shape, for example, to change a Manager to a Position, or a Vacancy to a Consultant. In the following exercise, you’ll import photographs during the process of creating a new organization chart. However, that technique is not the only way to manage org chart photos. 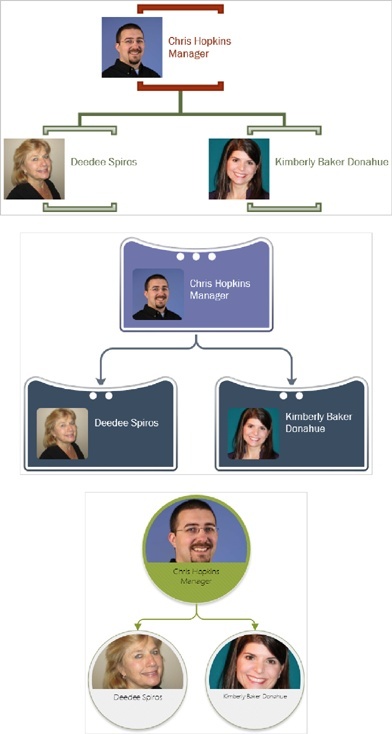 The Insert button in the Picture group lets you add one or multiple pictures to an existing organization chart. Additional buttons allow you to change, delete, or show/hide an existing picture. All of these functions can also be performed by right-clicking an org chart shape. Though themes are located on the Design tab and not the Org Chart tab, don’t forget that all Visio 2013 org chart shapes were designed to accept theme settings. You can apply any range of colors, effects, and embellishments to create exactly the look you want. The three examples in the following graphic use, from top to bottom, the Bound style and the Whisp theme; the Pip style and the Bubble theme; the Coin style and the Organic theme.